New! If you like your pizza a little spicy your going to love our new Mexicana Supreme Pizza. 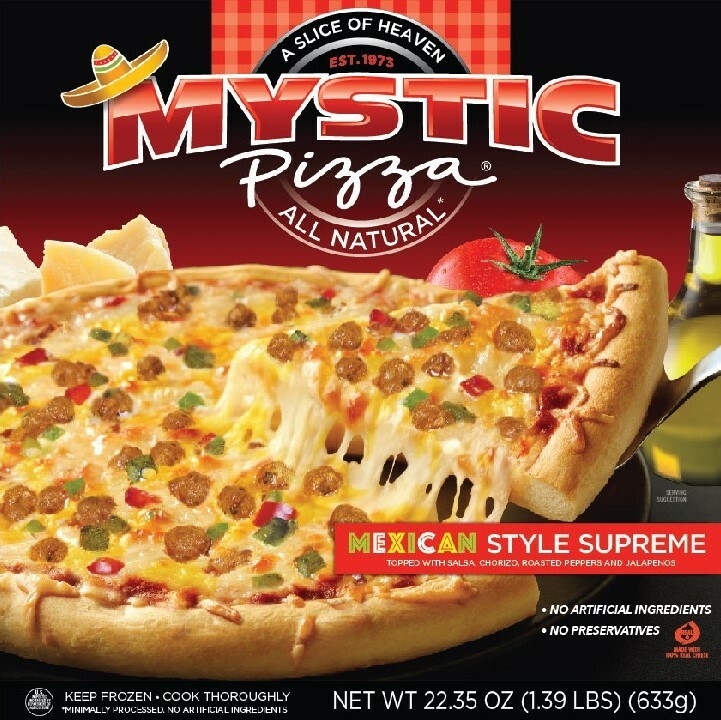 It’s starts with our traditional Mystic crust then we add our smooth salsa sauce, chorizo, roasted red peppers and jalapeno’s and loaded with whole milk mozzarella and yellow cheddar cheese. Only one word to describe it, WOW! Vine-Ripened Crushed Tomatoes, Sugar, Seasoning (Dehydrated Garlic, Spices, Dehydrated Onion), Salt, Romano Cheese (Pasteurized Sheep’s Milk, Cheese Cultures, Salt, Enzymes, and Powdered Cellulose [Anti-Caking Agent]), Basil, CHEESE: Whole Milk Mozzarella Cheese (Pasteurized Milk, Cheese Cultures, Salt, Enzymes), Cheddar Cheese (Pasteurized Milk, Cheese Cultures, Salt, Enzymes, Annatto [Color]), ALL NATURAL FULLY COOKED CHORIZO TOPPING: *Minimally Processed, No Artificial Ingredients, Pork, Salt, Spices and Spice Extractives, Water, Paprika, Onion, Garlic, ROASTED GREEN PEPPERS, ROASTED RED PEPPERS, JALAPENO PEPPERS.